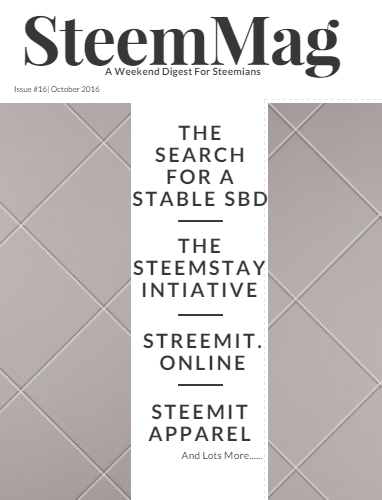 I’m excited to welcome you guys to the sixteenth edition of SteemMag, a weekend digest for Steemians. This weekend’s edition takes a look at the most discussed topic on Steemit this week - The stability and usage of SBD. A number of posts were written and several comments made by a lot of Steemians. Prominent among them were @smooth and @timcliff. With the market cap down 90% and SBD not having many uses, that puts a lot of stress on it. 90% declines can't be common and uses should improve. So ideally I see SBD as becoming far more stable and usable. SteemMag reached out to @clayop – a whale and witness. He has made a couple of posts analyzing the state of SBD and also made some pledges. SteemMag had a chat with the @klye, a backup witness and the man behind Streemit.online and coinpayment’s acceptance of Steem and SBD. @razvanelul --- the creator of cool SteemFest T-shirts. You've been quite vocal about declining price of Steem. What in your own opinion caused the sharp fall in the prices of the tokens? The price drop is a result of many complicated factors. However, in my opinion, the greatest single factor might be the SBD conversion combined with the price feed discount. In my analysis, I found that about 30% of total selling pressure, measured in net transfer to exchanges, was from SBD conversions (91k STEEM out of 291k), while, the devs sold around 2/3 of them (52k). One may argue that the SBD conversion is necessary to reduce the debt, but I found that although the conversion decreases SBD supply, the debt ratio has been increasing due to STEEM price drop. That is, if we convert and remove 1% of SBD, our SBD supply will decrease by 1%. However, if the conversion caused 2% of STEEM market cap decrease, it actually increase the debt ratio by 1% ((1-0.01)/(1-0.02) = 1.01). Actually, the debt ratio is increasing since 8/31 (I could not gather the data before) from 1.6% to 5.5% while about 1 million SBD was burnt. SBD was designed to be stable at $1. Why is this not so at present? Currently, SBD is like a gift card that has no store linked. Imagine that you got a Amazon gift card as salary but there is no goods on there. Your best choice is to sell the gift card into dollar, then you can buy food and pay rent and fees. We now have Peerhub but it is not that active at the moment. With very limited usages, people are more likely to sell SBD at discounted rates, and to buy Bitcoin or fiats (e.g. USD) eventually. As a count example, imagine that we can buy Mac Book Pro with 1,499 SBD, which is currently $1,499 at Apple store. Will there be any discount? Probably not. Or just a little. Despite the consistent efforts of Steemians (@smooth, you etc) to increase the buying pressure, why is this not having a positive effect on the stability of SBD? Imperfect competition. Before I joined the SBD conversion, there were only two (or can be one) major buyers in SBD market. Meanwhile, there have been many sellers who want to convert their rewarded SBD (due to the reason aforementioned) to BTC or USD. there are many competitors, and 2) they may feel SBD as windfall income from Steemit. We can see the result of this imbalance in the market. Despite that there have been about 3k SBD more buying power on average in last 30 days (which is significant volume to SBD market), the SBD price did not rise steadily. In my opinion, one possible thing is that some top witnesses, who receive rewards from Steem, buy up SBD regardless of some losses, given no liquidity reward. However, it seems no one did that. So, as a former top 19 witness, I decided to buy up SBD at 0.95 (when I elected again, 0.97) regardless of some losses, and you can check sporadic upcandle in Bittrex's chart. Over the last 24 hours, there has been a slight rise in the price of Steem? In your opinion why is this so? And how can we sustain this? I think announcing the short-term roadmap is the reason. Based on that, we will have possibility to decrease the inflation rate and vesting withdraw period, etc. This is very attractive suggestions for traders. But this is not enough. In my opinion, we need to address continuous sell pressures from the SBD conversion and powerdown. This can be done by smaller feed price discounting or cooperative decision for Steem price increase, etc. I would like to remind that maximizing individual's profit does not always end up with the best result, as explained in the prisoner's dilemma. Finally, what long term plans would you like to see being implemented to help raise the price of Steem and stabilize SBD? First and most of all, market places for SBD and supporting gateways (like Coinbase for BTC). Thanks @clayop for taking the time to have a chat with SteemMag. We look forward to having a stable SBD. All the best! What inspired you guys to start Steemstays? And is it exclusively for Steemians or a general take on the general hotel/travel niche? I was driving to work one day and this idea popped in my head. I nearly forgot about it cause I didn't write it down and was wracking my brain trying to figure it out on the drive back. I asked @aizensou to help out with the coding and @b0y2k with the design part and @jesta for general expertise. It was more of a 'spur of the moment' idea that we ran with. Initially, the alpha version of the site will be geared towards steemians, but the goal is to have it be open to all. This also brings in more people outside of the small cryptotoken community that exists into the Steem ecosystem and to be more aware of blockchain technologies in a more general sense. In what way will having the platform up and running help the overall steem ecosystem? Another marketplace to spend your SBD! I think encouraging traveling and cultural exchange is good. We're already a global community, let's use that to our advantage and have fun! What has been the most exciting part of the journey? And the biggest challenge so far? I think hearing out other users are excited about the project is the best part. As far as the most challenging, I dunno. We have really only started. My guess is that we may have some legal issues to have to deal with as an advertiser for people who are providing short-term accommodations. What are your long term plans for Steemstays? Where do you see the platform in 6-12 months of its launch? I think right now we're looking at something basic where we are providing an escrow service for payment and a platform for people to post their rentals with a review system for guests and hosts. I don't think we were originally trying to disrupt vacation rental market as we still rely on a partly centralized solution. At the end of the day, we hope to provide cheaper rates for people who wish to advertise their rentals. Since we're on the blockchain, we don't have to worry about credit card fees. I think that's where we are able to stay competitive over AirBnB and VRBO. Just a reminder that VRBO was bought out by Expedia for 4 Billion USD cash. This is a big industry, and we aim at providing some cheaper options than what currently exists. Awesome post! upvoted and resteemed!